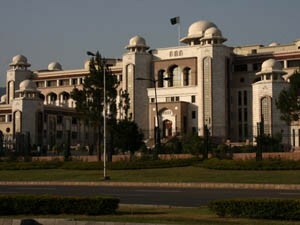 Mi visit to Pakistan served to understand a little more about this area so complex of the world. According to Adnan, the Taliban is a fundamentalist religious and political movement that arose in Afghanistan, during the civil war which began after the Soviet occupation. I arrived in Pakistan from Dubai, by air. After 6 months in the gulf I didn’t have many options to keep cycling, and because I wanted to avoid the Iranian and Pakistani Baluchistan I preferred to take a plane to Islamabad and avoid the conflict area that today punishes the country. When I was in Dubai I was interested in the Pakistan Airlines ticket, the only one company which let me to carry up to 60 kilos on the flight to Islamabad. Because of this, I went to its central office and I asked for the Gral Manager, to introduce myself and to request him authorization to travel with other 25 kilos extra, including a bicycle. Mohammed, who had a long beard like most of the Pakistanis, didn’t make me problem and gave me the ok. But when I arrived at the airport they didn’t allow me to board, because the size of the bicycle box was so big and heavy. But I insisted, I called to Mohammed and I arranged the bags to carry more weight up with me. Finally they allowed me to go aboard, but very nervous. Once I arrived to Islamabad, the capital city, I took a taxi to F10 market. On the way we crossed a bomb squad truck, and for it I reflected. Then I was received by Adnan, who manage his small construction company. And it was great, because he hosted me in his department for guests. There I stayed for few days, to know the city and to understand a little more about the situation of the country. In those days the Pakistani army supported by USA launched an offensive against the Taliban inside the country, who came closer more and more to the capital city. 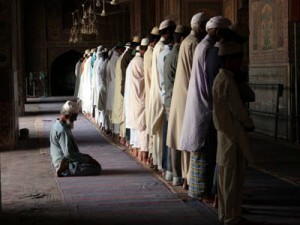 It is because at the beginning of the 2009, after two years of confrontation, the Pakistani Government accepted the Taliban’s demands, of imposing the Islamic law or “Sharia” in the valley of Swat, where they had already developed a blockade campaign and demolish against the government politicians, stressing the traditions of the villagers. With the Islamic law the Talibans imposed their norms but they also caused the displacements of thousand of villagers. The agreement also demanded the disarmament of the Talibans, but they didn´t do it, and on top of that they have proclaimed its intention of extending the Sharia to the whole country. For this, to my arrival to Islamabad the local government already possessed airplanes, helicopters, tanks and terrestrial troops in the area. According to the press the Talibans were involved in kidnappings, policemen’s death and the forced recruitment of youths for training for the “sacred war” or jihad in Swat. But on the other hand I have also listened that the talibans didn’t bother during the occupation and that people escaped from the Pakistan army bombing, because they didn’t distinguish civil from militant. According to Adnan explained to me, the Taliban is a fundamentalist religious and political movement that arose at the End of 80s in Afghanistan, during the civil war which began after the Soviet occupation. Due to the Cold War context and to that the talibans tended to limit the influence of the theocratic régime of Iran with the one that were antagonized by their strong anti-Shiite factionalism, the Islamic fundamentalist guerrilla was supported by United States, Saudi Arabia, Pakistan and other Muslim nations. This way, after the diverse resistance groups against the Soviet occupation took Kabul and established a government marked by the internal confrontations and the civil war, the talibans arose like an alternative, characterized by the predominance tribal Pashtun and the extreme religious severity, generating in the population expectations that the civil war and its abuses would finish. This way in the 90s, the talibans took the power by the force, but with the popular support; and later they controlled almost the whole country, declaring their main objective: “to impose the Islamic law and to get a state of peace”. But in 2001 the talibans gave refuge to Osama bin Laden and for this United States attacked Afghanistan, overthrowing the Taliban régime and pushing them toward Pakistan. “Now they are being pushed another time, and they don’t have where to go”, Adnan told me. “But not everything is bad about the talibans; during their government in Afghanistan the cultivation of the opium was practically eradicated, it has always been a problem for Pakistan. I don’t judge them for how rigid they are with their punishments, if they cut a hand or if they stone a woman, it has nothing to do with me. That is a region where the State is absent and the local population is ruled differently. That the women don’t go to the school is not a problem for the talibans. There are also many boys who don’t go to the school. 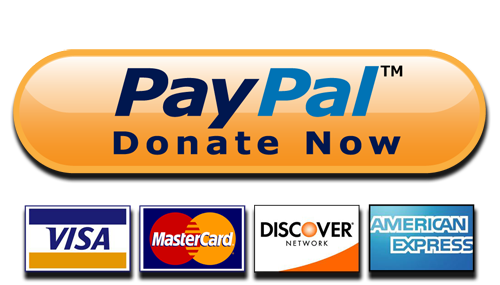 The real problem is that most of the population suffers of inadequacy of food, clothes, housing, medical care and more. There is not work but there is inflation and everything had worsened since the military operations. At the beginning they were supported to conquer the Russian and then forgotten, because advances in infrastructure were not made. The talibans felt betrayed. The terrorism has to be combated with politics in the countries that have it, not with armies that devastate people. But I also don’t support the talibans”, Adnan continued, “because their mind are closed to change and because they are stupid for not negotiate”. During my stay in Islamabad, I also met the Argentinean Ambassador, Rodolfo Martin Saravia and Eduardo Bustamante, the Consul. They were very kindly; they introduced me to the press and advised me in the best way. I also visited the Faisal Mosque, the biggest of the country, which was built by the king Faisal of Saudi Arabia. I left Islamabad after 10 am; it was too hot and in spite of the fact that it was weekend there was a lot of traffic. But the road was not very difficult, it doesn’t have big hills and there are only 330 km up to the border, for it I planed to cycle them in 3 days. After 1.00 pm, I began to feel weak, so I understood that I should stop to have lunch. This way I stopped in the first restaurant that I crossed, but after seeing its hygiene and hundred of flies flying on the saucepans with food inside I desisted and I kept cycling. Then, after few km I stopped in the following restaurant, where there were more people, most of them truck drivers, but I found this place dirtier than the first one and for it I returned to the road. I kept cycling for another while, but I began to feel worse and with the necessity of making a stop and eating something. Generally I don’t use to cycle more than 4 hours without resting and eating something; for it when I saw the next restaurant I didn’t have doubts and I stopped to have lunch. But the place was as dirty as the first ones and also plenty of flies flying on the food. I was too tired and without option where to go, so I came closer to the counter and I looked the different specialties. Some of them were undecipherable and due to the lack of communication with the local people I understood that I didn’t have any chance to choose. For it I prayed and I requested a vegetarian plate. It was too spicy!!!!!!! And I kept cycling, during the whole afternoon. At 6.00 pm I crossed a couple of hotels where I stopped to check; but one was very expensive and the other, according they explained to me, could not lodge foreigners because they didn’t have the license. It was a shame, because it was cheap. 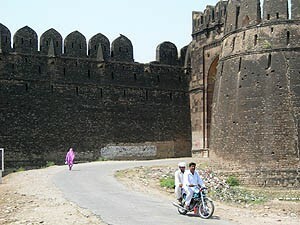 After few km I saw a small road toward the Rohtas Fort, so I thought that it could be a tourist place where I could find a hotel to sleep or even a good place to camp. The night was coming and I didn’t have a lot of time to find where I would sleep. When I arrived to the place I discovered an old citadel, a mini walled city with high walls where people live till today, and inside city the fort where I went. There Mohamed came to me and he introduced himself like a tourist guide, he sold me the entrance and he guided me through the fort. But, there also were some policemen who after knowing my intention of camping, they ordered me to sleep in the police station, because the place didn’t have any hotel and because according they explained to me it could be as dangerous for me as for them. What means, if something happened to me, they would have serious problems. On my way to the police station, I stopped with my guide near his house, where one of his children brought me a plate of food, some potatoes with scrambled eggs and bread. It was very good. Then I went to the police station, where after a while I laid in one of the beds of its central hall. And I liked, it was a big place and with a couple of roof fans. But that night I passed one of the worst nights in the whole trip, because at once that I went to sleep light cut off, and the fans stopped. It was too hot and plenty of mosquitoes. Suddenly I began to feel strong cramps in the stomach and to transpire a lot. So, at once I drank a paracetamol, but I didn’t have any medicine for my stomach pain. Then my mineral water finished and I began to drink water tab. The night was so long and I felt very bad, running to the bathroom every two hours. It was newly during the dawn that I could sleep a little, but only a couple of hours, because the policemen who did not know what happened to me left the police station early and they closed it, and for this I had to leave with them. I was destroyed, without forces to cycle and I felt as a hole in my stomach, but without any option in that village I preferred to leave. That morning I had breakfast with two liters of seven up which gave me the force to cycle the 8 km to the main road. There I drank another couple of bottles and then with the last forces I loaded my bicycle to the roof of a bus to arrive to Lahore as soon as possible. The trip lasted 5 hours because the bus stopped each 5 km to pick up people, for some moments I counted almost 100 people inside the bus, there was not place neither to move a leg. But during the bus trip I understood that it was safer to arrive to Lahore cycling than by bus, because the driver drove as a real animal. When I arrived to Lahore I called to Ishaq, an Argentinean ambassador’s friend who received me in his house as if I was one more of his family. And it was good because there I improved, with enough rest, some medicines and a good diet. Ishaq was part of the members of the Lahore Polo Club which together to the Punjab Olympic Association organized a meeting with the press and did a donation to the project. 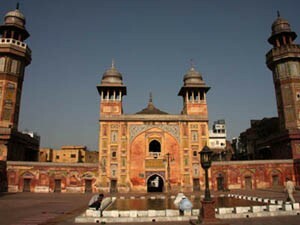 I stayed in Lahore for 4 days where I visited the Fort, the Badshahi and Wazir Khan Mosques and its market. In my last day the city has been witness of another attack, the third in three months that also points to the group of violence Taliban for the support from the Pakistani government to the “war against the terrorism” of United States which had caused the death of almost 2000 people in the last two years in the whole country. There were shots, grenades and the explosion of a car bomb in the complex where several police buildings and the provincial headquarter of the intelligence services of Pakistan exist. It had left 30 deaths and more than 200 wounded. It was time to leave the country.